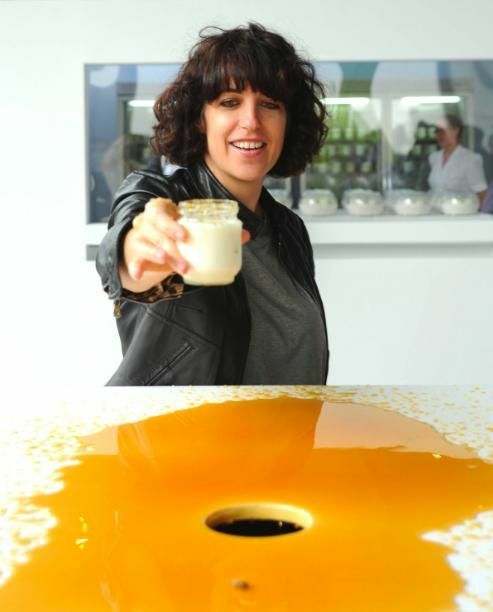 Last week we heard that New York-based artist and food writer Jennifer Rubell might not be hosting her annual art installation/breakfast during Art Basel Miami, so we were surprised to read in the New York Times recently -- the piece has now been "corrected" -- that it was happening. We checked in with Rubell and discovered that her Brooklyn studio had flooded during Hurricane Sandy and that, alas, she would not be hosting her annual breakfast. Here, Rubell chats with us about skipping her breakfast for the first time in 11 years, what projects she's working on next, and the two new shows that, starting today, are open to the public at the Rubell Family Collection (95 NW 29th Street, Miami). Sad to hear about your studio. You must be disappointed? What happened? What were you planning to do in Miami? Thank you, but of course many people suffered and are still suffering a great deal from the storm -- I feel like I got off lucky. My studio in Greenpoint was flooded with a foot and a half of water. Some of the elements I was working on for this year's project were destroyed. I'm not disappointed -- I've been doing the breakfast project during Art Basel for 11 years, and I've been waiting for a sign that it was time to stop. The first one I remember going to had big piles of stuff and rubber gloves for the bacon. What was your favorite year? I don't have a favorite year. I love "Old-Fashioned," the freestanding wall with thousands of old-fashioned donuts. I love "Incubation," last year's piece, where nurses were making yogurt in this kind of milk nursery and passing it through a slot to people who would hold it under honey dripping from the ceiling. I love all the projects, both individually and as a group of works that charted my progress as an artist. What are your mom and dad doing this year at Basel with the Rubell Family Collection? My mom and dad and my brother Jason. They do everything that has to do with the art collection together. There are two shows this year. "Alone Together," which is essentially 28 solo shows of artists in my family's collection; and then a show of Oscar Murillo, a very exciting, very young artist originally from Colombia who lives in London. He lived at the collection this summer and made the work there. When I last saw you last, you were expecting. How old is your baby? I now have a 6 month-old boy. He's delicious. And he was the inspiration for a massive piece I'm working on for next summer. You'll see. Looking forward to anything in particular at AB/MB this year? It's the first year I've ever not done a project, so I'm looking forward to everything. I usually miss so much. My clip of your "Nutcracker" at FREIZE/NY was a hit on Vimeo. What was the story behind that piece? Any plans for mass production? The piece came about when the Dallas Contemporary asked me to do a show and someone told me about a Neiman Marcus warehouse with all the mannequins not currently in use. For my show in Dallas, I made 18 different nutcrackers, and I destroyed all of them after exhibition was de-installed. Lysa I -- who you, um, 'interacted' with at Frieze -- is a kind of super-woman version of the nutcrackers in that show. Eventually, there will be a series of 10 Lysas, each one an evolution from the one before. I finished Lysa II last month and am now starting Lysa III. I'm thinking of casting from a live model later in the series. The Rubell Family Collection's "Alone Together" and "Oscar Murillo: work" are open now through August 2nd, 2013.